Lightweight and portable, the Minimix 150 mixes a full barrow-load. 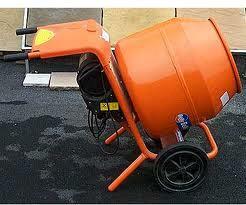 Will mix 275 lbs mortar or concrete. * Please call us for any questions on our cement mixer 3 cube concrete wheelbarrow rentals in Eden Prairie Minnesota, Bloomington, Chanhassen, Minnetonka and surrounding Twin Cities communities.